Good News! The recently axed 1630 Cremyll to Plymouth service has been replaced by a new service - operated by A-Line - meaning a connection is available for schoolkids and workers! It is running as far as Cawsand. Today marked the first day of operation for route 81C. I've attached a couple of photos. Firstly, above is WA 54 OLN operating the final ever 80B service, at the top of Millbrook West Street. It was also the last service bus to run through West Street for many, many years. The second photo, at the very top, is of WA 54 OLO with the first ever route 81C service to run from Cremyll (the 1026 to Bretonside.) Heron is pictured at Insworke. Today marked the final day of routes 80, 80A and 80B. The 81B will also be scrapped in its current form - being renumbered 81C. I will be posting a couple photos taken over the last couple of days of running, including the last ever 80B, which was unusually operated by a Trident, as opposed to an Olympian. WA 54 OLN (32759) Swan had the honour. In this post, it is pictured on Southdown Road back in April 2006, operating on the first day of Sunday services to the Insworke estate. Today was the last week day of 81B. I am not here tommorow so I am saying it today. I am going to France so I can't be doing the blog. Hopefully I am getting a friend to do it (Luke pleace check your inbox) but if he doesn't I will be back next Sunday. Just to show you above is one of the keen enfusiasts taking pictures on the last few days. Today is the start of Millbrook lake nerest to Cremyll. The Tamar Cruising flagship vessel Plymouth sound laqst month celebrated her 20th year running up and down the Tamar from the Barbican. She was built in Voyager boat yard in Millbrook. The design was verty popular but she was one of the last built under old regulations allowing the passengers to sit below the bow. All other boats after have had to be at the same hight as the bow so water doesn't get in. 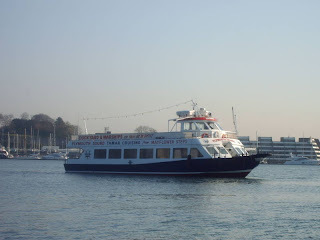 Many companies have desired the design of Plymouth Sound but try as they hard Voyager have never been able to perfect it in the same way though have been very good like there latest example the SeaBus which is acctually the same length as Plymouth Sound. Anyway. Well done Plymouth Sound. Hopefully many plesurable years will be left to come from her. Sorry I haven't posted for a couple of days. 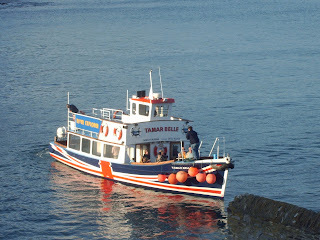 Yesterday the Tamar Belle of Tamar Cruising was on her first trip to Cawsand for a while probebley a coiple of years. She came over with a party of about 30 on board. It used to and at a slip way in Garrett Street right outside my house. But in the winter nearly all of the steps at the bottom where it lands were broken away. There was still enough room for her to land but at the steps a barrier had been put up to stop people using the steps. 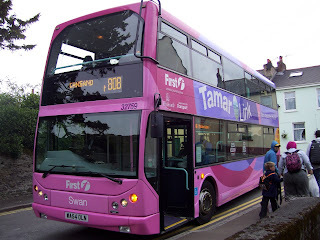 So the dissappointed passengers had to go back with no visit to Cawsand and there money wasted. Well done Tamare Crusing. 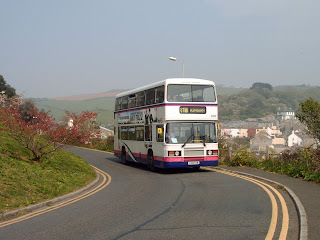 Today is Dennis Trident 32758 (Egret) coming towards Cawsand Surgery. Another installment of the 81B project. The Volvo Olympians I have mensioned in a previous blog for Torpoint have now been taken to Laria Bridge depot to have there ferry lift added. These will come into service when 181 and 81C are introduced. Thought there is no picture of the new Leyland Olympian or one of the Volvo Olympians. Visit the link below to see them. But looking at this picture my beloved LFJ 844W has moved and is now not in the place she has sat for nearly a year. The picture above shows the Dart which is still there but she is now not. I hope to bring you more news about this as I get it. Could this be her re-paint after a year of waiting or have they given up and she has gone for the scrap? We will have to wait and see. 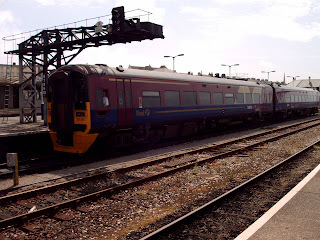 Today on an outing to Paignton I saw a very rear train to these parts. 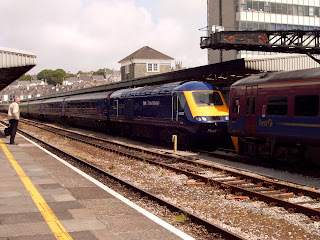 Pictured above is First TarnsPennine Express 32765 covering for a class 43 to Penzance. So that train has come the whole length of the country. It's just stupid. Why bring a train that far there must have been one closer to home. And what was even more rare was that there was two trains on one platfrom. It was on the same platform as a class 43 going to London. Today I was speaking with the manager, owner and driver of A-Line travel Jim. As I have mensioned in a prevoius blog in the "All Cornwall" timetable book A-Line travel is now opperating new services. This is acctually all wrong. "All Cornwall" never notified Jim about this change and just put him down presuming he would do it. They used old tietables that he used to use many years ago thay are not official. So ignor it. Unless Jim does decide to opperate the new routes it is an hour and 10 miniute wait for me. Oh and another correction the new Torpoint bus timetables do not start on 20th they will start on the 27th as I was notified today by bus driver Peter Giles. So just 10 days to go. I am getting my camera out. And just to make it interesting the 20th is a Sunday. Today the new 'All Cornwall' timetable was brought out. I picked up one this morning on 34002. I thought it would be the same old times or a couple of minutes changed, but no. I turned to the page 81B is on. At the top of the page was not 81B Plymouth Bretonside-Cremyll it was 81C Plymouth Derriford Hospital-Cremyll. I had to look a few pages back to find 81B which is now Plymouth Bretonside-Polpero the same route as 81A except it is more frequent. There has also been major timetable changes. 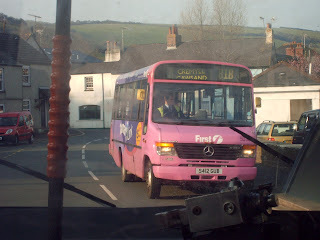 81B at the moment is 0740 at Cawasnd Triangle it is now 0730 so gets to Cremyll 7 minutes earlier. This is now the same with all the 81C routes. They are all about 10-15 minutes before. This now means my afternoon 81B is now at 1615 not 1630 so the ferry doesn't get in quick enough and now I have too wait until 1740 for an 81C. But luckily local nearly unknown company A-Line Travel are doing a 0747 in the morning and a 1630 in the afternoon so Jim is our savior. And this is now the same with all the buses; none of them will meet the Cremyll ferry undercutting them every time. 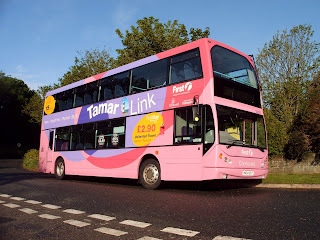 There is also no more 80 services they are only 81s so that mans the 'Tamar Link' branded livery is now wrong. 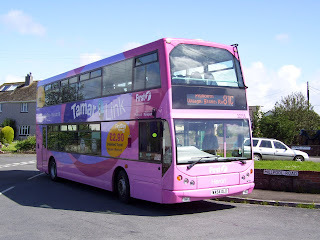 And they have introduced a new service 181 Torpoint-Liskeard. This now also means my film project is now rubbish as I would have to do the whole route in 10 days. Why oh why have they done it. All it will do is cause caouse confusion and rebel. 'First transforming travel' but mucking it up as they go. I am going to start the series with i film of 32756 (Heron) climbing Fourlanesend hill. Sorry I haven't been posting for a while I have been busy doing other things like my magazine and a new project for a competion. I am doing a competion for young people to get involved in making a film of anythig you want. My idea is I am going to film the whole of route 81B but none of it on the bus it will be all outside the bus. To make it more interesting I am going to do it in all weather and all buses so one minuite it will be a Dennis Trident then when it turns a bend it will transform into a Mercedes Vario. I have estimated it is going to take me 240 films of 30 seconds so I have to wait for 240 buses and there is only one every hour. And to put even more presure on the deadline is October the 1st. That is only about 150 days. So I need to adverage about one a day but I have to fit everything else in as well like homework and my magazine. Well its to late to turn back now. So over the next 150 days I will give you clips of what I have done that day normal news will also be included. Devonport High school for boys has recently been given timetables telling the school about the 121 and 122 services. 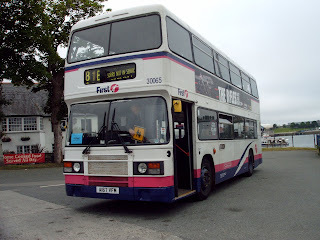 The bus arrives at Landrake at 1640 on the return journey, it would then go to Liskeard station at 1702. It then gets to the next stop at exactly 1702. Then, the following entry on the bus’s timetable is for Callington at 16:34! Some 28 minutes earlier and then, it reach’s Kelly Bray at 17:02 exactly the same time as it is supposed to reach Liskeard Station. So, not only can it travel through time, but through Space as well! It may also interest you to know, the bus driver doesn’t get paid overtime for effectively doing a journey twice! 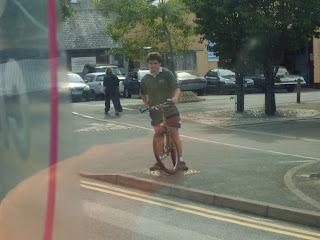 Yesterday I was waiting for my bus in Cremyll with a few other people. Well as usuall I counted the miniutes it is late. But it is only usuall a couple of minites. Then it was ten minites and then half an hour. Finally it did turn up and it was not the usual Mercedes Vario it was Volvo Olympian 34002. It was a trainee driver so asked his instructor Tony why they were late presuming it was just the trainee driver. He replyied that they were on a Vario (50306) and it had overheated and needed a replacement bus. I have heard from other people in the summers there are a lot of breakdowns because of overheating. Matters might be helped now with the withdrawal of the last Bristol VRs (R.I.P) but acctually seems to have got worse with the aging Mercedes Varios. Don't really see them replacing them but this does seem to be becoming a worse and worse probeblem with the Torpoint fleet. 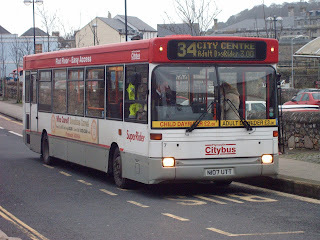 And the situation is made worse again by the Leyland Olympians which are the same age as the old VRs with the same engine so really it does still pose the question why choose same age same engine Leyland Olympians over the Bristol VR? I personally would much rather be on a Bristol VR that a Leyland Olympian. If anyone knows why please e-mail(laurencemayhew@btinternet.com) me but I can't see the awnser myself. 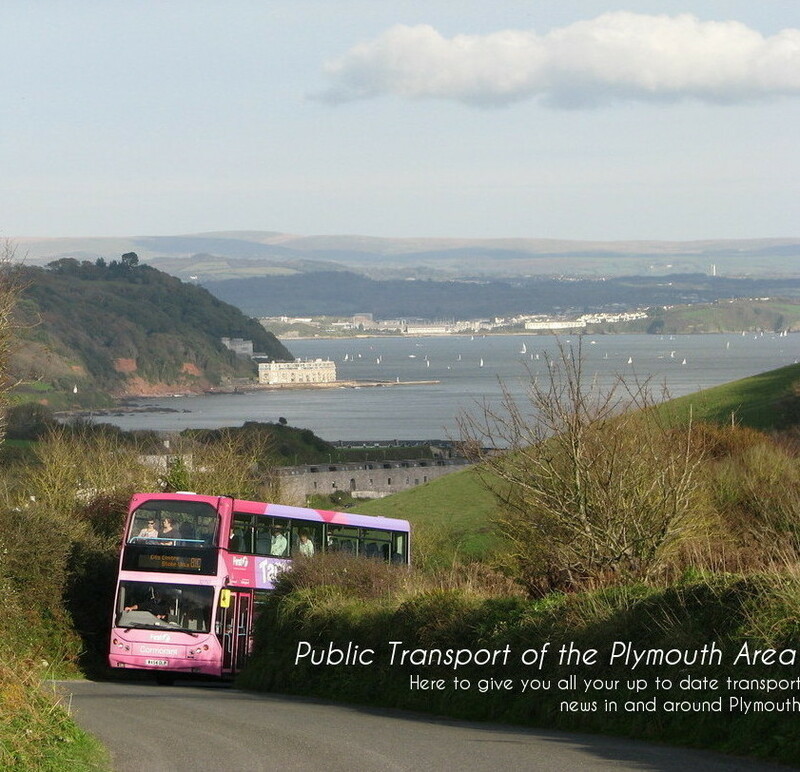 So expect more late buses on the Torpoint routes.